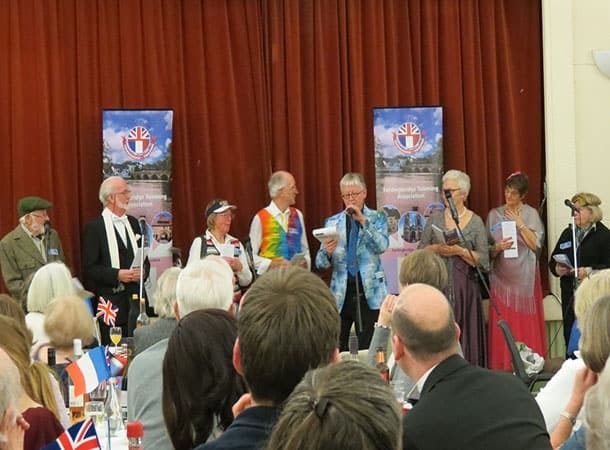 The Fordingbridge Twinning Association held its annual (always a sell-out) Murder Mystery evening last Saturday evening 3rd February. This was the 22ndMurder Mystery evening that the Twinning Association has put on, this time, at St Mary’s Church Hall, in Old Fordingbridge. The tradition continues….thanks go to the actors: Peter Stammers, Keith Bennett, Derek Ayling, Helen and Trevor Tague, (that intrepid partnership), Bridget Marriott, Annie Mitchell and Lynne Pearson. (All held together by Inspector McClue, played by that infamous Ian Newman). Thanks also go to all the helpers, washer-uppers, chefs and table layers! The next Twinning event will be the AGM on 26th April, and everyone is welcome. At the AGM, the Fordingbridge Twinning Association will be celebrating its annual Youth Competition, which this year, will be based on the theme “100 years”. As we all know, this year, 2018, celebrates the centenary of the end of World War 1, and there are other important events to celebrate too, including (some) women winning the right to vote, the discovery of penicillin, and the installation of London’s first traffic lights!. The annual “Sandy Boules” competition will take place (at the Sandy Balls Estate) on Thursday evening 21st June (the longest day this year) and then of course, there will be the Twinning’s annual visit to Vimoutiers, in October. Immediately followed by the (again, always a sell-out) Musical Soirée”, which this year will feature the same band as last year (“Blue Tides”, which was so popular), on Saturday evening 27th October, in Fordingbridge Town Hall. Featuring the genuine French cuisine, which will have been purchased in Vimoutiers only one week before. So….lots of reasons to join the Fordingbridge Twinning Association then.